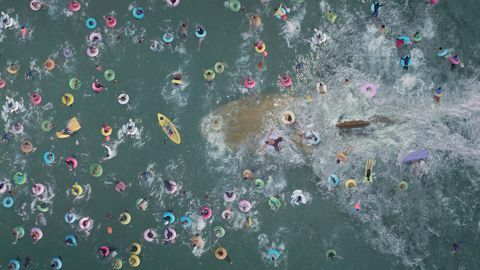 The Meg review: "Once the gargantuan fish finally makes an entrance, the film finds its sea legs"
Living up to its billing as the most ridiculous film of the summer, The Meg is one to laugh at rather than with. Instantly forgettable, but undeniably fun. First, the bad news: Jason Statham does not punch a 70ft prehistoric shark in The Meg. A missed opportunity, for sure. But it’s no spoiler to say that The Stath does go mano a mano with the deadliest predator Earth has ever known, and the results are a riot. Alas, by that point, the shark has been well and truly jumped. Walking a fine line between tongue-in-cheek monster movie and Asylum production (one with a tentpole budget) The Meg sees deep-sea rescue diver Jonas Taylor (Statham) team up with an eclectic group of scientists stationed at research facility Mana One. There, they stumble across the toothsome terror’s hunting grounds at never-explored depths of the Mariana trench. The opening section, both needlessly long and criminally Meg-less, is a bit of a slog, making a meal of introducing each archetypal member of the science team surrounding Jonas. There’s love interest Suyin (Li Bingbing), techie-with-’tude Jaxx (Ruby Rose) and retrograde comic relief DJ (Page Kennedy). But once the gargantuan fish finally makes an entrance, the film finds its sea legs. Jonas, a ludicrously heroic and fearlessly capable man of action, takes point on a series of high-risk missions, swimming solo into Meg-infested waters and harpooning a tracker on her fin before making a high speed escape as five rows of 8-inch teeth nip at his flippers. Director Jon Turteltaub (National Treasure) wrings these sequences for every morsel of tension, even if genuine scares are few and far between. It’s in densely populated beach resort Sanya Bay that The Meg is at its outrageous best – adorable terriers, lolly-sucking adolescents and bothersome zorbers are all tantalising morsels for the shark to devour. Yet the bulk of the film’s mid-section, bizarrely, is staged in the middle of the ocean, where the beast looks like a wind-up Great White in the bath against the endless expanse of blue. Dialogue swings between perfunctory and unintentionally hilarious (sample 'zinger': “That living fossil ate my friend!”) Only a handful of the cast seem in on the joke, including Rainn Wilson, who gnashes the scenery as the obnoxious billionaire bankrolling the operation. After proving his comic chops in Spy, The Stath's self-awareness is left on dry land as he lets his iron pecs loose in the year’s most gratuitous shirtless scene. A little more depth (no pun intended) wouldn’t have gone amiss. With toothless FX that make you wonder where the film’s reported $150 million budget went, The Meg falls firmly into the ‘so bad it’s good’ camp of summer movies. If that floats your boat, open wide. Anyone looking for more meat on the bone should stay out of the water. If you want more films of the gore variety, why not check out our pick of the best horror movies?